Facebook is a social networking platform which allows you to keep in touch with friends and to keep up to date with the latest developments. The following instructions reveal the basic steps needed to create and maintain a Facebook page. To sign up to Facebook, you may use any internet browser available on your laptop, desktop computer or tablet. As you access the https://www.facebook.com/ website, you should be able to view the Facebook mobile app download section, the login button, and the Sign Up form on the home page. There are five boxes to fill in with your personal information, one for the first name, one for the surname, two for the e-mail address and one for the chosen password. 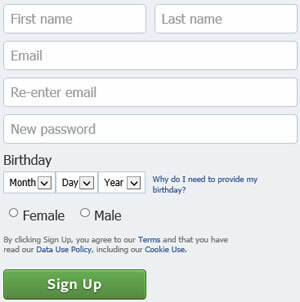 Three drop-down lists allow you to select your birthday and two checkboxes give you the ability to select your gender. Store the chosen password and sign up information for future use. After reading the Terms and the Data Use Policy, press the Sign Up button to be given instant access to the Facebook networking platform. Additional information will subsequently be required of you in order to set up your profile. 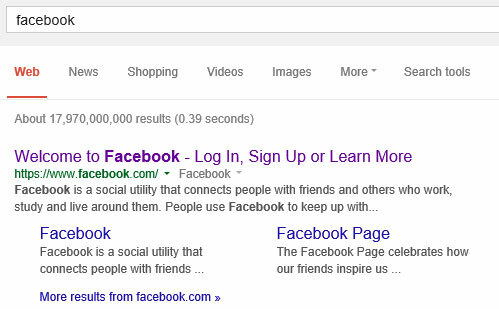 Once you’ve created a Facebook account, you can access it using the https://www.facebook.com/ URL, or by googling ‘Facebook‘ on whichever Google search engine corresponds to your particular country. To access Facebook by proxy, read through the Terms before granting other people permission to act on your behalf. To log in, simply type in the e-mail address or telephone number in the designated box on the upper right-hand side of the homepage, followed by your password. In the event that you expect to use Facebook extensively and would dislike being logged out repeatedly, tick the box labelled ‘Keep me logged in‘. Next, simply click ‘Log in‘ and you should be able to access your network of friends instantly. To logout, click the downward pointing arrow icon at the far right of the Facebook toolbar, on the top of any Facebook page. Select the ‘Log out’ option from the drop-down list. Should you encounter any problems with the login process, click the ‘Can’t log in?‘ link underneath the Password box on the homepage, or use the https://www.facebook.com/login/identify?ctx=recover URL. Enter any profile information you remember to be valid. To search for the account using the information provided, click the designated Search button in the ‘Find Your Account‘ section. Then select the reason you can’t log in by using the checkbox labelled ‘I’ve forgotten my password’. Alternatively, abort by pressing ‘Cancel‘. If you’ve tried to retrieve your account information but were unsuccessful, use the ‘I can’t identify my account‘ link below. If you know your password and would like to change it, select the Settings option in the drop-down list on the far right of the top Facebook toolbar, and click Edit in the General Account Settings>Password section. To change your password, type your new password and click ‘Save Changes‘. To create a new page, use the “Create a Page” link on the Facebook homepage, underneath the Sign Up form. Otherwise, select the ‘Create Page’ option from the drop-down menu on the far right of your Facebook toolbar, after logging in. This takes you to ‘Create a Page‘, available at https://www.facebook.com/pages/create/. You must first select the purpose of the page you want to create. 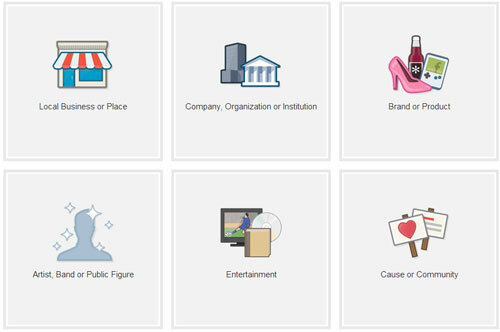 To promote a business, a tourist attraction, an institution, a product, a brand, a public figure, or a cause, chose the designated box, select the category and name from the drop-down list, along with any other information requested, and click ‘Create Group‘. The list of instructions above is by no means exhaustive, though every effort is taken to update it constantly. Should you require additional information, access the Facebook Help Centre at https://www.facebook.com/help/?ref=contextual. Enjoy your virtual networking experience with Facebook! When I downloaded for updates, I received all updates on my opening page except for FB. I have tried every way To open my FB. Help! My FB page is blank. Why? I have been unable to post comments on facebook. What should I do ! How do I fix the problem!